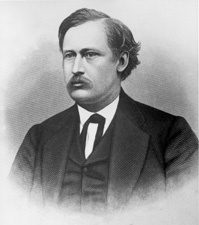 PADDOCK, Algernon Sidney, a Senator from Nebraska; born at Glens Falls, Warren County, N.Y., November 9, 1830; attended the public schools, Glens Falls Academy, and Union College, Schenectady, N.Y.; taught school and studied law; moved to Omaha, Nebr., in 1857; was admitted to the bar in 1857 and commenced practice in Omaha; unsuccessful candidate for the Territorial house of representatives in 1858; delegate to the first Territorial convention in 1859; engaged in editorial work on the Nebraska Republican 1858-1859; secretary of the Territory of Nebraska 1861-1867, performing the duties of Acting Governor part of this time; unsuccessful candidate for election in 1866 to the Fortieth Congress; unsuccessful Republican candidate for United States Senator in 1867; declined to accept the position of Governor of the Territory of Wyoming in 1868; moved to Beatrice, Gage County, Nebr., in 1872 and engaged in manufacturing and agricultural pursuits; elected as a Republican to the United States Senate and served from March 4, 1875, to March 3, 1881; unsuccessful candidate for reelection; chairman, Committee on Agriculture (Forty-fifth Congress); member of the Federal commission having jurisdiction over elections in the Territory of Utah 1882-1886; again elected as a Republican to the United States Senate and served from March 4, 1887, to March 3, 1893; chairman, Committee on the Improvement of the Mississippi River and Its Tributaries (Fiftieth Congress), Committee on Agriculture and Forestry (Fifty-first and Fifty-second Congresses); engaged in the brokerage business; died in Beatrice, Nebr., October 17, 1897; interment in Prospect Hill Cemetery, Omaha, Nebr. Dictionary of American Biography; Shepherd, Allen L. Gentile in Zion: Algernon Sidney Paddock and the Utah Commission, 1882-1886." Nebraska History 57 (Fall 1976): 359-77.